We can blend the best of our wisdom with the best of theirs. We can teach and learn from each other to produce closer circles that foster community and commit to diversity. People who include with intention, raise their hand to do the work of embracing what is unfamiliar. Es ist die Quelle allen Lebens und das Element, das 60 Prozent unseres Körpers ausmacht. Es ist die Flüssigkeit, von der wir nicht genug trinken und die wir dennoch in vielen Regionen verschwenden. Es ist die Heimat von Millionen von Arten, Geheimnissen und unentdecktem Wissen. Tatsächlich wissen wir mehr über die Sterne am Himmel als über die Tiefen unserer Ozeane. Wir können es benutzen, um Leben zu retten. Leider kostet es auch vielen Menschen das Leben. Und es ist immer wieder Thema in Filmen, in der Musik und natürlich in der Literatur. Wasser und Literatur? Wasser und Witz? Wasser und Unterhaltung? Genau unser Ding! In diesem Monat, beim CreativeMornings Berlin, mit unserem Sprecher Michael Bukowski. 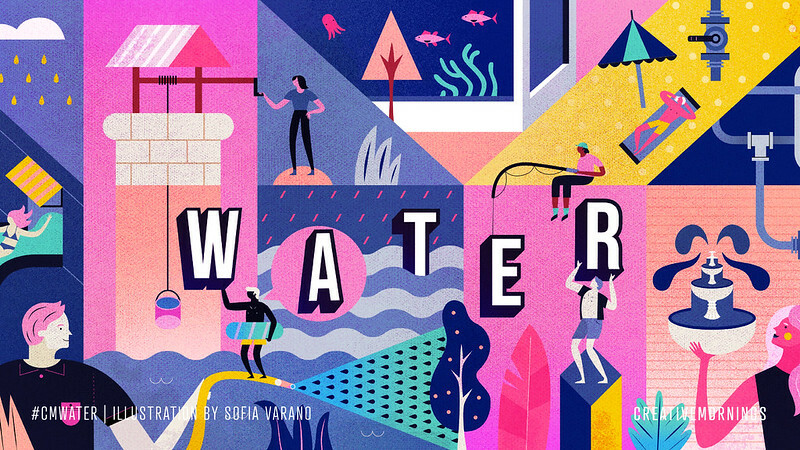 Das Thema wurde von unsern lieben Kollegen in Perth ausgesucht, und die Illustratorin Sofia Varano hat es grafisch in Szene gesetzt. 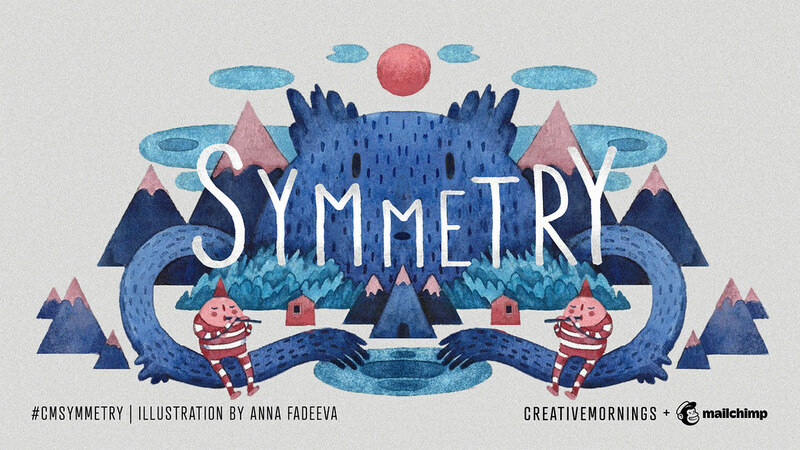 Alan Lightman wrote in The Accidental Universe, “I would claim that symmetry represents order, and we crave order in this strange universe we find ourselves in.” But chaos will happen whether we like it or not, it’s how we respond to it that either creates order or more chaos.When in chaos, create your symmetry. When you look at the artwork of Frida Kahlo or Salvador Dalí, there’s an element of surprise. Why does it feel familiar yet also otherworldly? Surrealists sought to break free from the shackles of the rational mind and dive into the deep end of the unconscious. The canvas, then, became a mirror for what emerged out of that process. This movement was inspired by events in the 1920s on the heels of the first world war and continues to influence artists, writers, photographers, and filmmakers. This cultural and artistic movement ushered in new techniques that helped humans expand their minds. Today, we recognize a sense of the surreal in unexpected moments in daily life. Art exhibits like Yayoi Kusama’s Infinity Room are becoming readily available, encouraging people to immerse themselves in experiences that break reality. A ballet performance or a silent meditation retreat can be a dreamlike experience.Whether we experience a surreal moment or dabble in processes like drawing without thinking or writing without self-editing, there’s something to be learned about ourselves and what lingers under the hood of our desires to keep life orderly and controlled. 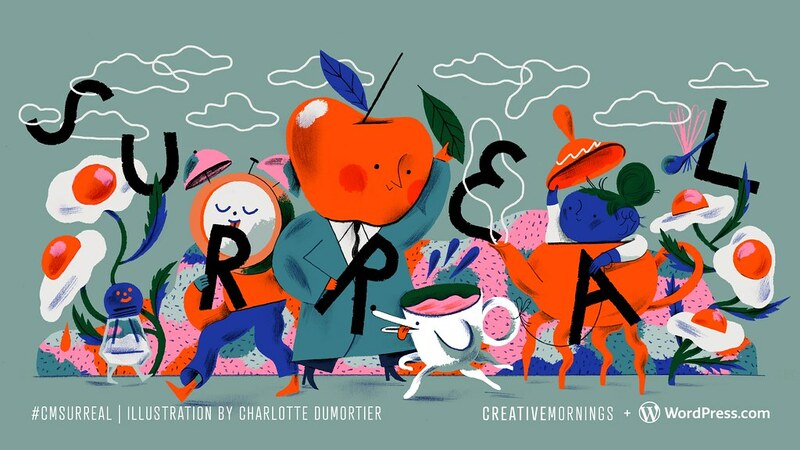 Our Brussels chapter chose this month’s exploration of Surreal, Charlotte Dumortier illustrated the theme, and WordPress.com is the presenting partner. Note: Berlin will take a break this month. Maybe you happen to be in another creative city on a January-Friday. 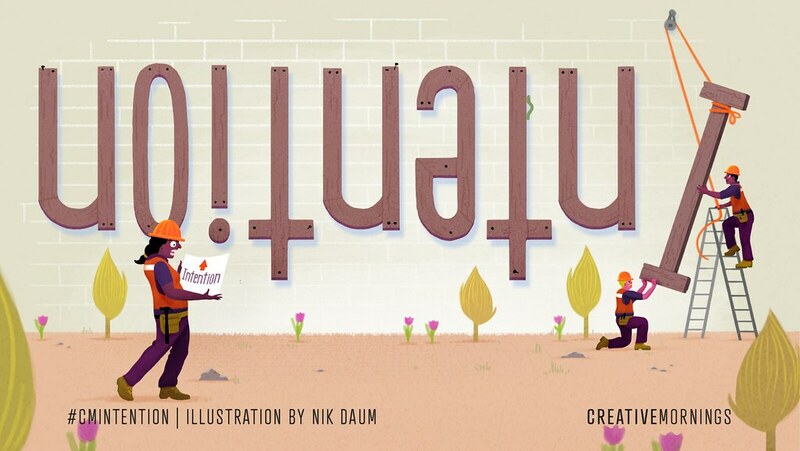 Why not visit a Surreal-CreativeMorning there ... e.g. London, Lausanne, Zurich, Cologne, or Hamburg? 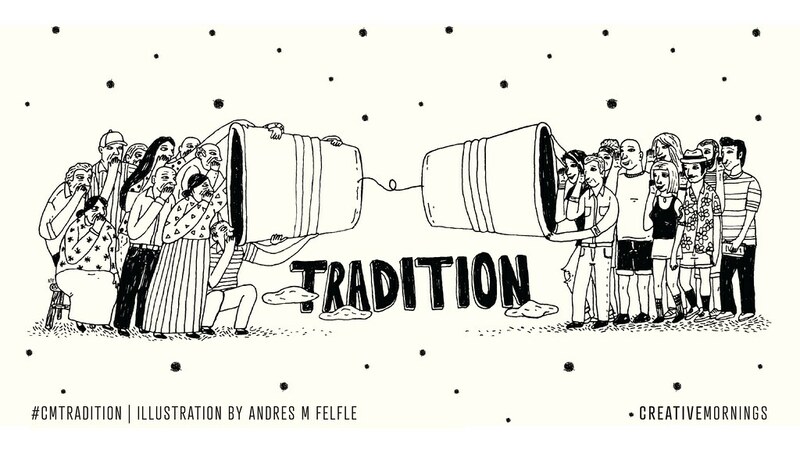 Our Barranquilla chapter chose this month’s exploration of Tradition and Andres Manjarres Felfle illustrated the theme. So we finally cave in and heed the words of people who’ve found their centers again: take a trip into nature, go for walks, unplug completely.The challenge with restarting is that we often save it for the end rather than creating pockets throughout our weeks where we prioritize reflection and solitude. Restarting is essential. It’s a way to digest experiences, reflect and cultivate self-awareness, and remind ourselves that life is to be enjoyed. It’s refreshing and feeds greater intention and momentum into our creative endeavors. 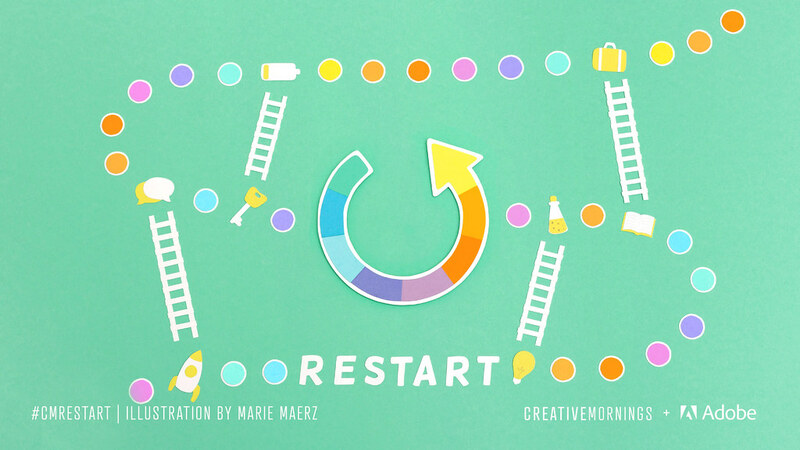 Our Cologne chapter chose this month’s exploration of Restart, Marie Maerz illustrated the theme, and presented globally by Adobe. 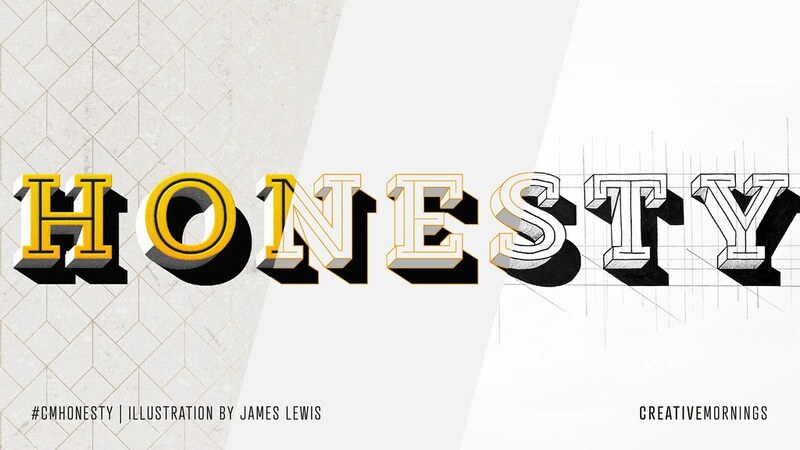 This month’s global exploration of Honesty was chosen by our Cardiff chapter and illustrated by James Lewis. When you think of chaos, you might think of utter confusion, a jumbled mess, destruction, or Slack being down. But previously the word “chaos” had a different meaning. In ancient Greece, writers and thinkers described chaos as more of an abyss, an empty void that existed before life. It wasn’t until the 1600s, when it was adopted by the English language, that it grew undertones of mass confusion or pain. Life, by nature, is chaotic. And the human brain is beautifully designed to turn chaos into order. Whether through storytelling, art, or through the veneer of self-delusions, we’re built to handle the randomness and uncertainty of daily life. When a tornado rips through town, one person may see chaos where another sees a fresh start. So, then, a creative addendum: We are in control of the story we tell ourselves about the events that unfold before us. We can view chaos as a freight train hitting our soul or we can see it as a catalyst for clarity. 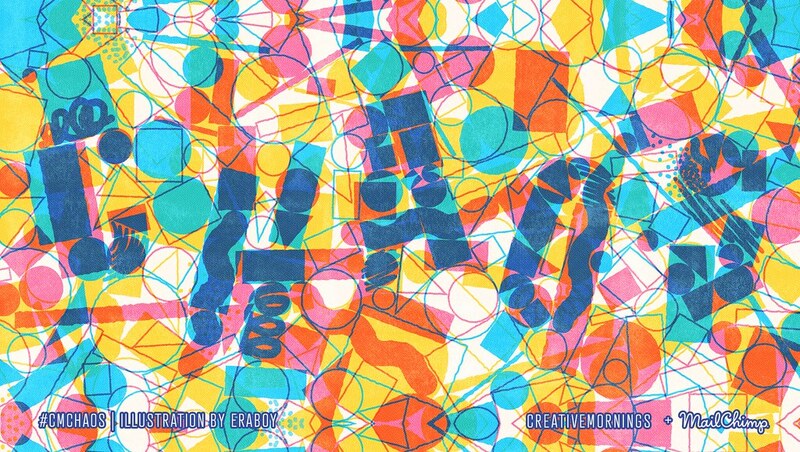 This month’s global exploration of Chaos was chosen by our Tijuana chapter, illustrated by Eraboy, and globally presented by MailChimp. 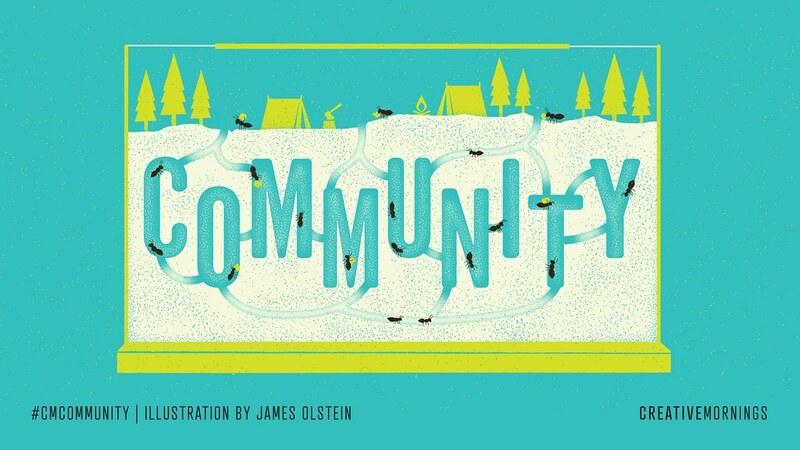 A sense of belonging can be fostered in many ways: food, music, volunteering, a cause. You can scan a room and see a diversity of backgrounds, ages, and skill sets—yet the common thread is shared desires and aspirations. It's magnificently profound how simple this connection is, how deeply we all crave it, and how it changes the trajectory of our lives. 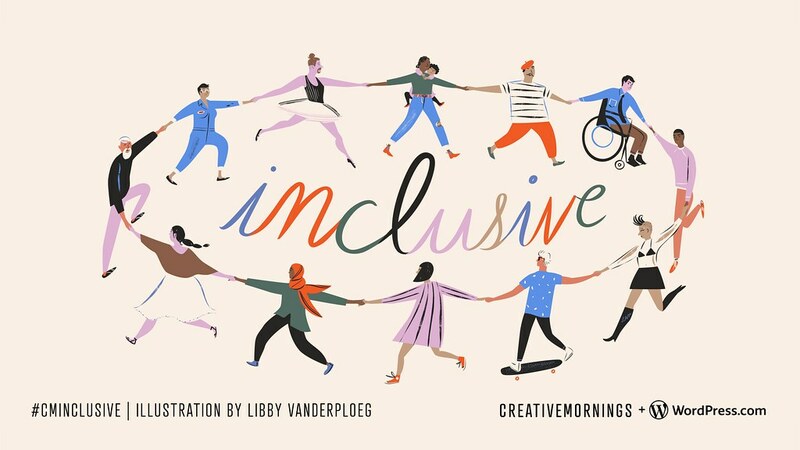 Please note: CreativeMornings Berlin will skip in August. See you on September 7.